Sometimes I think I take too many photographs of some scenes. 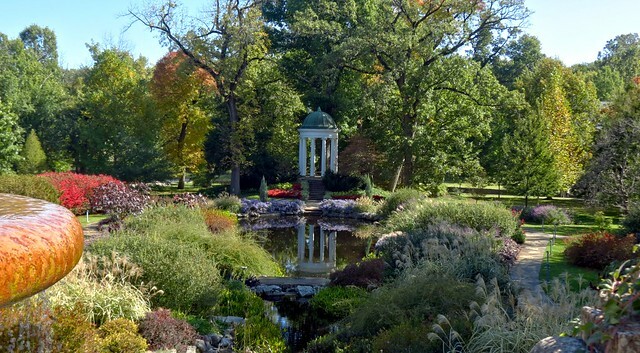 LIke the tempietto in the gardens at Philbrook Museum of Art for instance. 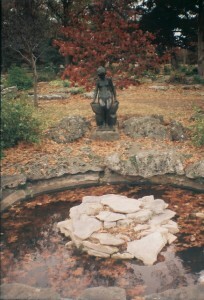 I think it is one of the most beautiful scenes I’ve ever seen especially with the reflecting pool in front of it. Based on a tip from Spare Parts and Pics I downloaded the Topaz’s Impressions program. It converts photographs to look like a painting or drawing. The above pic uses one of the “Colored Pencils” presettings. The program is a little expensive, at least for me, so I’m “messing” with it on a 30 day free trial. Let me know what you think of it. For comparision the original photo is below. It is not SOOC though. 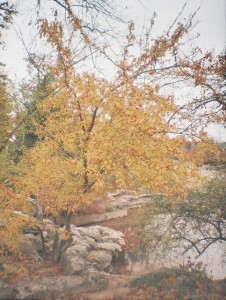 It is an HDR composite. Just in case you are new to this blog I need to tell you that I don’t worship pics straight out of the camera (“SOOC”). This entry was posted in Water World Wednesday and tagged Fiiters, Gardens, Philbrook Museum of Art, Photography, Reflections, Tempietto, Topaz, Water, Water World Wednesday on November 5, 2014 by Alan Bates. I took this pic back in late November before it got real cold. 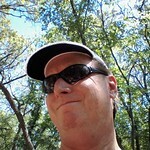 I took with my Diana Mini Lomography camera in the split frame mode where it puts two pics on one frame. So this pic is from one half a frame. I just love the solitary moodiness of it, the low fidelity, the grain of the film, the whole deal. I even love it that the pile of white rocks dominates the pic and almost looks like a giant, creepy flower blossom, and the dark sculpture is obscure. Why does the camera have a half frame mode? If you find out tell me and then we’ll both know. It is quirkiness like this that makes me love my collection of strange little plastic cameras. 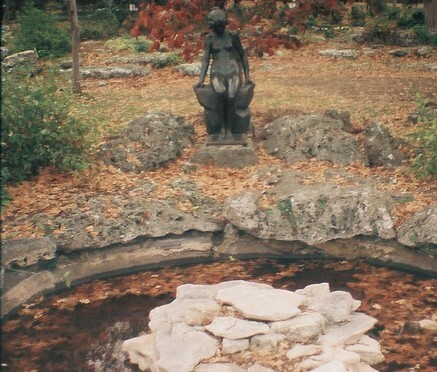 This entry was posted in 35 mm film, Diana Mini, Lomography, Water World Wednesday, Woodward Park on December 18, 2013 by Alan Bates. From our recent trip to Idaho. Canoes make great photographic subjects, interesting shapes, bright colors, and nice reflections. But really they are meant to be used. 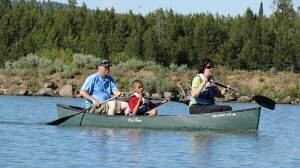 This is our family flotilla during our recent outing in Idaho. 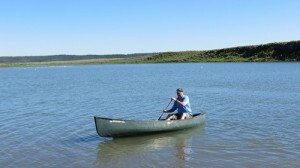 BIL Irv really looks good by himself in the canoe. He really looks like he know what he is doing. A little bit later grandson Mr. Beans and my sister Ellen joined them. Notice Irv’s technique of sitting in the back and letting the other two do all the work. That is how we guys do it. And there is Sweetie and SuperPizzaBoy. I joined them a little later. 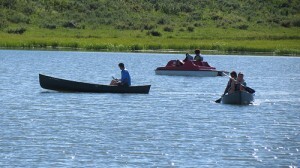 After a stern warning to SuperPizzaBoy to not overturn the canoe. Nothing tickles his funny bone than topping dad into the deep. I had the good camera with me. 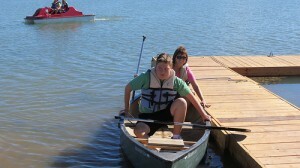 We paddled around a bit. 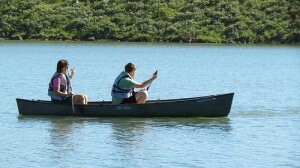 Of course nobody else had a camera, so you will have to take my word for it. 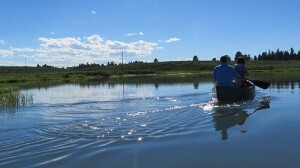 Nothing like fun on the water in Idaho is there? 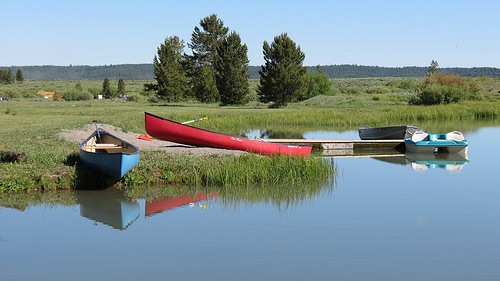 This entry was posted in Canoes, Ellen, Family Reunion, Idaho, Irv, SuperPizzaBoy, Sweetie, Vacation, Water, Water World Wednesday on July 9, 2013 by Alan Bates. A couple of waterfowl landing on the Arkansas River in Tulsa last week. This entry was posted in Arkansas River, Birds, Reflections, Tulsa, Water, Water World Wednesday, Waterfowl on March 12, 2013 by Alan Bates.